Today the sun rose at 10:55 a.m. and set at 2:57 p.m. giving us 4 hours and 2 minutes of daylight, which is 3 minutes and 15 seconds more than we had yesterday. Tomorrow we will enjoy 3 minutes and 30 seconds more daylight than we had today. We tend not to notice the change until someone remarks that they realized they were driving to work as the sun was rising, instead of in utter darkness. I notice the change when I find myself feeding dogs without having to wear a headlamp. Before we know it we’re waking up at 3 a.m. in complete daylight and wondering if we slept in, or we’re doing yard work at midnight and waving at the neighbor who is doing the same. Right now though we are accustomed to driving back and forth to work in inky darkness, hoping our high beams will catch the movement of a 1,500 lb moose at the treeline before he steps out onto the road. Children wearing headlamps and reflective clothing trudge to their bus stops at the end of goat paths no school bus can possibly maneuver. Every rural Alaskan kid is well-versed in what to do if they meet a moose. On weekends and holidays many of us get outside in the light and enjoy pursuits like snowmaching, skiing, dog mushing, skating, cutting wood and ice fishing. Before long we notice that the sun suddenly has some warmth to it and the gardening instinct to get starters going is triggered. 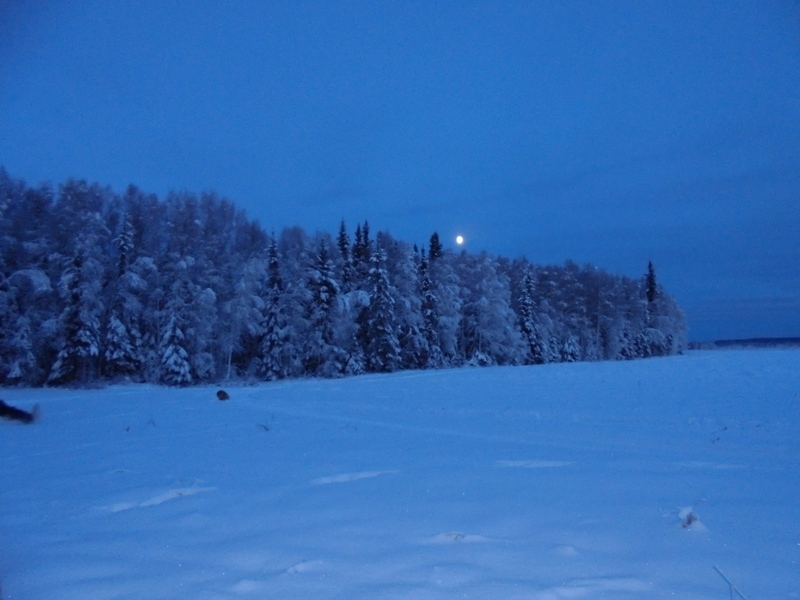 We gripe about the darkness and the cold of course but we are Alaskan and so we just shrug our shoulders and resign ourselves to bundling up, activating hand warmers and wearing headlamps. I don’t mind the dark for there is something comforting about it. Maybe it’s because I have lived in places where the sun set in November and didn’t rise until the end of March. You simply get used to it. 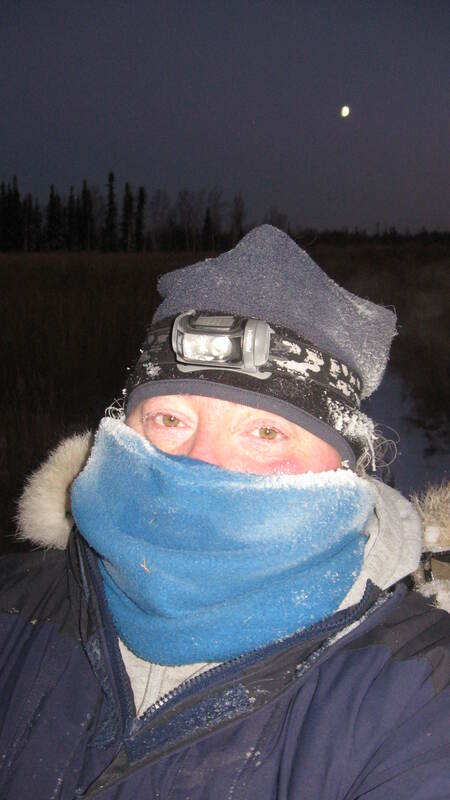 Some of my favorite images are mushers with headlamps in a checkpoint. They walk down the line of dogs and the view is very limited. The dog; the straw; red, chapped hands taking booties off the dog’s feet; worn and sometimes duct-taped bunny boots; breath rising from canine noses tucked under tails; steamy food in dog bowls……snapshots of a moment in time. This afternoon I took Polar, Wooley and Sasha out for a run with the four-wheeler. We left about 90 minutes before sunset. I have some favorite spots on different trails and today we headed out towards a big field that is a favorite of moose. 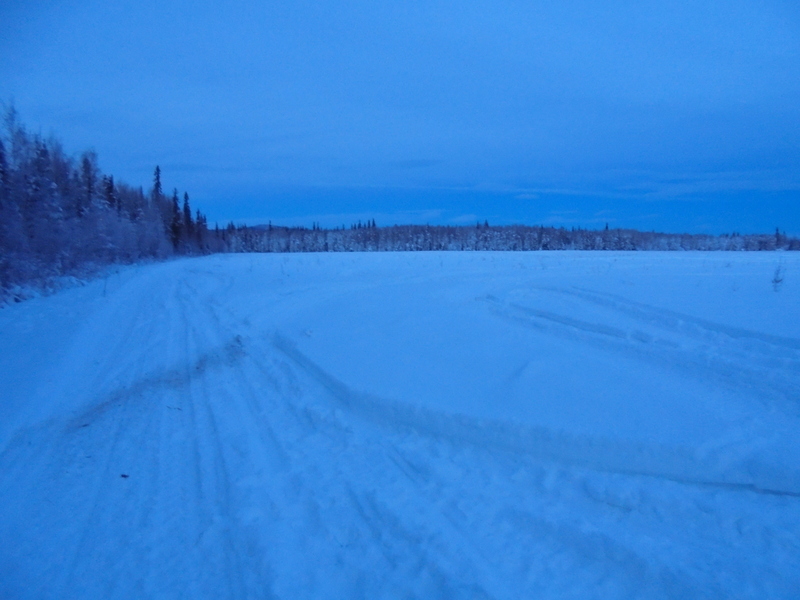 There was a lot of fresh tracks of moose who were meandering along the edge of the field munching on willows but thankfully we didn’t run into any. Moose can be very cranky this time of year depending on the availability of food. 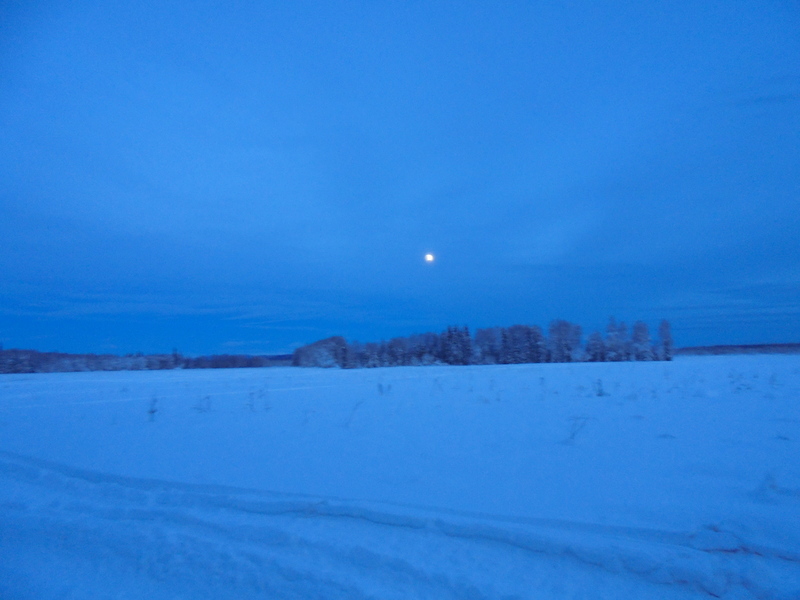 The light this afternoon was beautiful and the almost full moon certainly helped! Here’s a couple of pictures that I took – hope you can see the beauty I did. Peg!! You’re still around. Was happy to see this post. Happy New Year and I look forward to continuing to live in Alaska through you!!! LOL…thanks Peter! My goal is to be a more disciplined writer! Happy New Year! Good to hear from you Peg. Hope everything is going well and continues to do so thru the new year. I was just thinking of you last week….wondering how you are. All is good here and hope the same for you! Thanks Peg, I’m still kicking, so far so good. What are your thoughts on the new show “Alaskan bush people” about the brown family? I must say they are a bit different. Have you seen it yet? It seems that new show’s in and about Alaska have exploded lately. When is the Musherpeg show premier?